"Remember those yummy treats on a stick when you were a child? Frozen orange on the outside and creamy vanilla on the inside? Well, here's a cake that tastes just like those wonderful treats! 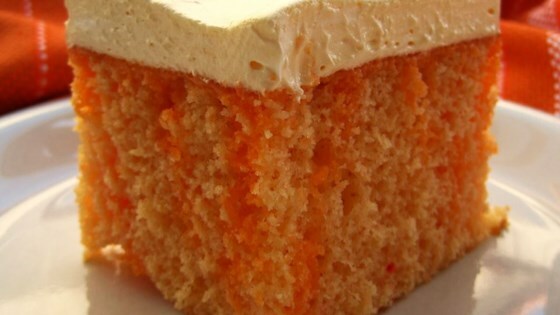 Note: If you cannot find an orange cake mix, use a package of lemon cake mix and add 1 small envelope of orange drink mix powder." Bake cake as directed in a 9x13 inch pan. When done, use a meat fork to poke holes across the top of the entire cake. Allow to cool. In a medium bowl, mix together 1 box gelatin, 1 cup hot water and 1 cup cold water. Pour over top of cake. Refrigerate for 2 to 3 hours. Mix remaining box of gelatin, pudding mix, milk and vanilla together. Beat well. Fold whipped topping into this mixture, and spread on top of cake. Chill in refrigerator until serving. Very good and cool on a hot summer day. Would be great for a carry-in. This is a great summer dessert, very refreshing and delicious. People always rave about it and ask for the recipe. I made no changes to the original recipe. Made this as directed. Easy and turned out great.